Shri Munipalle Raju was born in 1925 at Garikapadu, a village near Tenali in Andhra Pradesh. 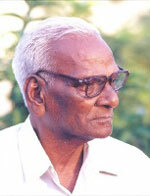 He spent his childhood in Tenali, a town that is known for its contribution to arts and literature in the early 1950s. He has four short story collections, including 'Munipalle Raju Kathalu' and 'Divo Swapnalatho Mukha Mukhi,' two collections of free verse, one collection of literary essays, 'Journalism Lo Srujana Ragaalu', and one novel, 'Poojari', (filmed by late BN Reddy as Poojaphalam in 1964) to his credit. He is the recipient of First Jyesta Literary Trust Award, First Raavi Sastry Memorial Literary Trust Award, Telugu University Award (twice), Gopichand Award, and Andhra Saraswathi Samiti Award, among several others. His 'Astitvanadam Avali Teerana', a collection of short stories, won the Central Sahitya Akademi award for Telugu fiction in 2006. It contains sixteen stories that are rooted in the rural milieu. They take the readers on a nostalgic trip to the ancient Vedic culture, as the characters in these stories struggle to come to terms with the all-pervading modernity. The result is: while the writer is pursuing his spiritual quest, his protagonists encounter intense conflicts. Cumulatively, the reader enjoys a meaningful discourse about life and its complexities. The Central Sahitya Akademi termed his work as an exceptional contribution to Indian short fiction in Telugu. The present story, 'Silence is not a mere word' is from the collection that won the Central Sahitya Akademi award. "Silence is peace. Silence is a boon. Silence is the blue sky’s spread out. Silence is the beauty of the flower-decked valley." As he opens the door of the bedroom, the sikhara of Rama’s temple grants Rao its august presence. Offers a Namaskaram from within the heart. Hazy darkness. Tulasi at the dawn. Silence—the spiritual encasement as of Indra’s bow. Withdrawing from there, he takes three sips of water from the copper pot, turns on the radio for listening devotional songs. Mild silence. Mind’s eye in its fullest bloom. Great peace. Well within ten minutes, the buzz of the milk van; tokens for two liters. White canvas shoe. A kind of morning-circumambulation ... of the colony … three kilometers. On return, attending to morning chores … bathing in cold water … two idlis followed by a cup of tea. Mother tincture for the insomnia of Mishra; tuza for the wart on the finger of Paramashivam. Silence is like the giant tree that spreads wide with prop roots. Silence is the exit door. Time—a wreathy-serpent hiding in a corner. Coming down from the upper floor, elder son took the milk bottles ... silently wondering: Nannagaru won’t be that lazy ever to respond! Five minutes. It’s perfect peace after the kids have left for the school—in that ultramodern house. Son doubted. Daughter-in-law came. Sandals are here only. Water in the copper pot is as it is—full. Blanket is as it was folded last time. Hasn’t slept in this bed last night? Window is shut. No incense sticks before Saibaba. Radio is silent. “Dial up younger sister.” No ... no, hasn’t come. Why so anxious ... what’s the matter? “Send wire to bavagaru. Send wire to babai. “Take out scooter ... go ... look around the hospital and come back”—instructions to the younger brother. Son—sank into a chair ... holding head in hands. “That’s not the issue… He talked about performing obsequies for his father… ‘not possible in the house, arrange it in a mattam’, said attayyagaru. Since then he stopped talking”, said thus intelligently, younger daughter-in-law. Double-edged tongue! “Can’t he understand us, we aren't strangers to him!? Yes! Uttered something in a bad mood. But you don’t know—that very night I went to his bedroom and sought his pardon,” said son. Silence is a word of seven letters. … a letter came from Palem hermitage. Silence – a shade of the tomb. Silence – a giant serpent. Silence – a great dream too. An enlarged photo of Rao garu is now prominently visible on the wall. There in front are the incense sticks ... smoldering. And a garland right on it, as an adornment. …authorities of the Palem ashram have sent all his papers. No one dared to open and read them. Remained as silent sounds of the worn-out palm leaves. The bell of the milk van didn’t stop ringing. Gudisikharam—continues to glitter in the rising sunrays. Ram Lal Mishra’s call, however, is not heard. Now silence: a fear. An anxiety. Sikhara—refers to the rising tower, mostly of brass, in the Hindu temple architecture of India over the sanctum sanctorum where the presiding deity is enshrined. Sikhara is the most prominent and visible part of a Hindu temple, seeing which Hindus feel blessed. Namaskaram—a way of offering prayer by Hindus; also, is a common spoken customary greeting when individuals meet, and a valediction upon their parting. A non-contact form accompanied by a slight bow made with hands pressed together, palms touching and fingers pointed upwards, in front of the chest. Tulasi (Ocimum tenuiflorum)—is a sacred plant for Hindus and is worshipped by Hindus as the avatar of goddess Lakshmi. Kakada Aarati—offer of lights (with five wicks) to Sri Sai Baba at the dawn. Bhai—Saibaba’s devotees are usually addressed as “bhai”—“my dear”. Karma—in Vedanta, it is the non-material residue of any action performed by a person, the cause of embodiment and of Samsara. In popular terms, every Hindu is inclined to attribute everything that happens—fortune, or misfortune—to his/her karma. Karma is commonly used to denote: action, destiny and also ‘prarabdha karma’—karma inherited from the previous birth. Sahib—a polite form of address in Hindi, often placed after a person’s name or title. Dhanurmasam—a name given to a period of nearly one month. It starts usually around 14-16th December and extends up to the mid-January. This period ends with Makara Sankranti. This month is considered highly auspicious by Vishnu devotees. Nayanaa—affectionate way of addressing the younger ones. Sumati Satakam— A book of 100 poems (Satakam) in Telugu. Sumati Satakam has been extremely popular for a long time with parents and teachers trying to teach the right conduct and social values to young children. “Rao sahib se kuch khabar – kuch letter”—“any news from Rao sahib – any letter”. 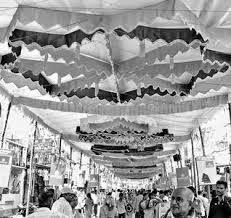 Rathasaptami— is a Hindu festival that falls on the seventh day (Saptami) in the bright half (Shukla Paksha) of the Hindu month Maagha. Rathasaptami is symbolic of the change of season to spring.